We are excited to share that Konami and the Yu-Gi-Oh! TCG will be on the ground at San Diego Comic-Con in just a few short days, sharing the latest and greatest from Konami Digital Entertainment, Inc. at booth #3713 from July 18th to July 22nd ! This year, Konami’s booth will be fully loaded with new activities and features, as well as bringing back some that fans know and love from years past – including the green screen photo booth with some fun backgrounds for fans to enjoy. 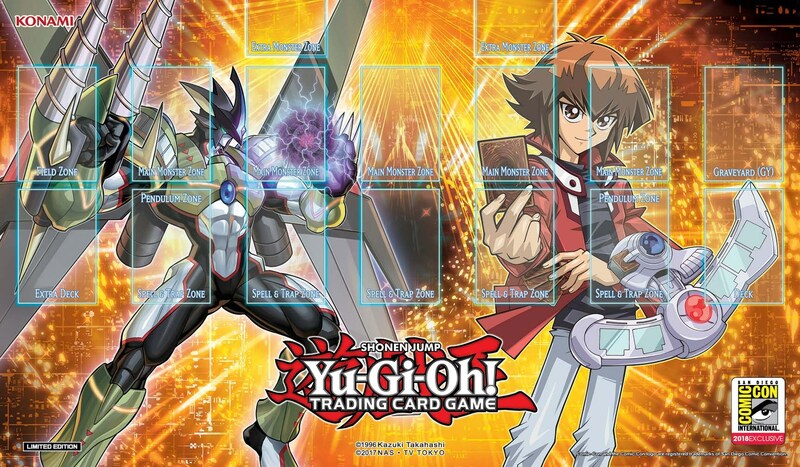 In addition to having some of their most recent products available for purchase, they will also be offering an exclusive game mat for SDCC, featuring imagery of Jaden Yusei along with Elemental HERO Nebula Neos. 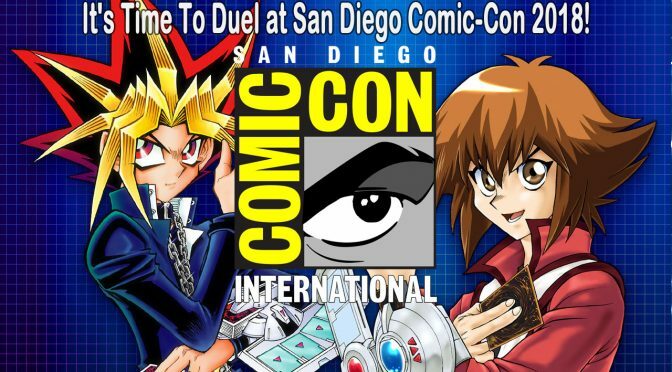 IT’S TIME TO DUEL AT SAN DIEGO COMIC-CON! El Segundo, Calif. (July 16, 2018) – Comic-Con International: San Diego attendees will want to make booth #3713 their first stop to see what’s new from Konami Digital Entertainment, Inc. (KONAMI) during the world-renowned five-day show July 18th to July 22nd. Year after year KONAMI is right in the thick of things, offering pop culture fans the latest and greatest from the world’s best-selling Yu-Gi-Oh! TRADING CARD GAME (TCG) as well as other new booth features and fun activities. Always a fan favorite, KONAMI will once again have the green screen photo booth. A Comic-Con must-have, fans can create their own exclusive one-of-a-kind Yu-Gi-Oh! Token Card. They can choose from 7 different card backgrounds, with Dueling legends Yugi, Jaden, Yusei, Yuma, Yuya, and Playmaker or the 2018 Comic-Con International: San Diego logo – suitable for use during Duels! Looking for a Con exclusive and the latest Yu-Gi-Oh! TCG products? Head over to the booth’s retail counter early in the show to get KONAMI’s Comic-Con International Exclusive Yu-Gi-Oh! TCG game mat before it sells out! Available for just $30, this collectible game mat features awesome imagery of Jaden Yusei along with Elemental HERO Nebula Neos! There will be plenty of products for sale too. Fans wanting to add to their card portfolio can purchase new and popular Yu-Gi-Oh! TCG products every day of the show while supplies last, including the recently released Battles of Legend: Relentless Revenge, Flames of Destruction Special Edition, Dark Saviors, and Starter Deck: Codebreaker, releasing July 19! With over 70 million downloads to date, the gaming app Yu-Gi-Oh! Duel Links continues to be enjoyed by fans worldwide on iOS and Android devices, as well as PC Steam, and San Diego Comic-Con attendees can experience this exciting game. Choose from a selection of pre-generated Characters, including a new, unreleased character, to Duel with their signature Decks, and battle your way to Dueling victory! For attendees that have Duel Links installed on their phones, they will be given a special Duel Links-branded lanyard, while supplies last! Attendees wanting to learn the game can take a seat at a game table to get a Yu-Gi-Oh! TCG demonstration from the experts! Those completing a demo will receive a show exclusive coupon good for one (1) free booster pack with the purchase of any sealed Starter Deck! (Redeemable only at KONAMI’s booth during Comic-Con.) Players wanting to tweak their Deck-building strategies can get helpful hints from KONAMI’s many Yu-Gi-Oh! TCG experts on-hand throughout the show. Plus, players feeling lucky and confident in their Dueling skills can spin the wheel to Duel the Master as he sits on his royal throne, for a chance to take home some other prizes! Duelists looking for more opportunities to show off their Dueling techniques can visit the Yu-Gi-Oh! TCG Organized Play Room #16B on the Mezzanine level where KONAMI will host a variety of Yu-Gi-Oh! TCG events from Thursday through Sunday including Win-A-Mats, 2019 Regional Qualifiers, ATTACK OF THE GIANT CARD! !, Duel Links tournaments and more! Dragon Duel Tournaments, for children born 2006 or later, will take place on Friday, Saturday and Sunday only. And best of all – these tournaments are free to Comic-Con attendees, so make sure to bring your pre-constructed Deck! Wednesday, July 18: 6:00 p.m. – 9:00 p.m.
Thursday, July 19: 9:30 a.m. – 7:00 p.m.
Friday, July 20: 9:30 a.m. – 7:00 p.m.
Saturday, July 21: 9:30 a.m. – 7:00 p.m.
Sunday, July 22: 9:30 a.m. – 5:00 p.m.